Have you ever wondered what MSU’s campus was like at a different time? The Campus Archaeology field school and the new Cultural Heritage Informatics (CHI) field school have developed a Gowalla tour that lets you wander through the campus of yesteryear. If you are unfamiliar, Gowalla is a place-based mapping/gaming program that people use on Smartphones. The person who you follow on this tour is Erasmus Cole – a fictional character who attended MAC in the early 1900s (he has a very snazzy avatar). Cole leads you through various stops on the Michigan Agricultural College tour. Some of the places on Cole’s tour are still around today, but others have long since disappeared. You don’t have to be outside or on campus to take the tour – just click on each “stop.” The “stops” feature historical photos of the sites, which come from collections in the University Archives, and Cole gives his thoughts and feelings about each building. Take the Michigan Agricultural College tour on Gowalla and visit the campus of the early 1900s! A small crowd gathered at the University Archives on Tuesday, January 19 for a lunchtime tour. During the 35 minute session, the visitors were shown the reading room, staff area, processing area, stacks, and movable storage. Some of the collection highlights on display included blueprints from College Hall, the first building completed on campus; a ledger from the John Harvey Kellogg collection; campus scrapbooks; early campus maps; and the letter written to William Beal from naturalist Charles Darwin. During the tour, the visitors learned the about commonly asked questions at the University Archives. The two types of photographs that are most often requested are athletics and University buildings. They also met the unofficial mascot of the University Archives, Belle Sarcastic, a cow owned by Michigan Agricultural College. In 1897 she became the world’s record holder for producing 23,190 pounds of milk and 722 pounds of fat in a single year. She held this record for 11 years. Another mascot of the University Archives is Sarcastic Lad, the son of Belle Sarcastic. He was the grand champion at the 1903 St. Louis Exposition. Though they are not often asked about, the staff at the University Archives take every opportunity to fill in people about our two mascots. Any guesses? Send in your thoughts and comments about how the Michigan State University yearbook came to be called the Wolverine. We will post the answer later this spring. Records Archivist Whitney Miller shows some of the large campus maps in the University Archives. Have you ever wondered what the restricted stacks of the University Archives look like? Do you have questions about MSU history, but didn’t know where to look for the answers? If you are interested in MSU history, archives, or just need a warm place to be, we have got the thing for you. On Tuesday, January 19 between 12:15 – 12:50p.m. the University Archives & Historical Collections will lead a tour through the facilities for faculty and staff of MSU. 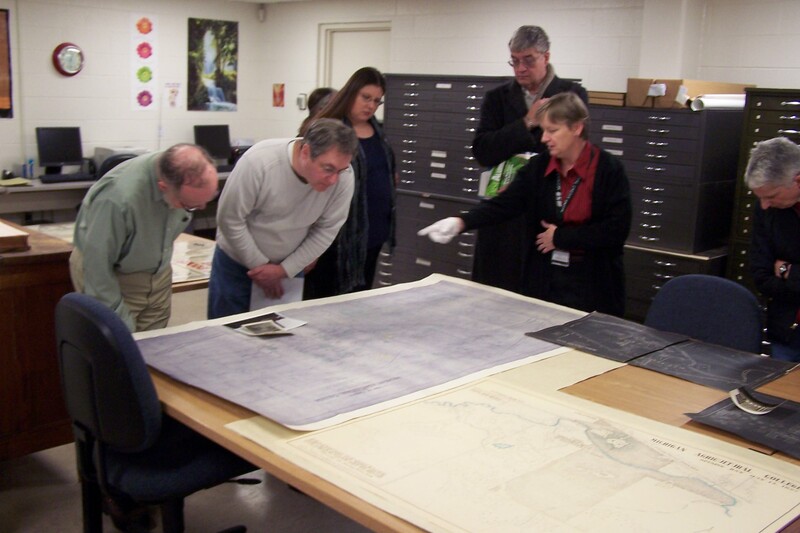 The tour is scheduled as part of the University Collections Council tours of collections on campus. No pre-registration is necessary. Anyone wishing to take the tour should arrive at 101 Conrad Hall shortly before the start time. The closest staff parking lot is Lot 32 across from Fee Hall. Tourists will be shown the facility and will have a chance to view some of the gems of the archives. Some highlights of the tour will include viewing of the letter to MSU’s botanist William Beal by naturalist Charles Darwin; class rivalry posters; dance cards; early athletic programs and photographs; and scrapbooks from alumni. Also on display will be items not pertaining to MSU but rich in historical value including Civil War diaries; business ledgers from the Battle Creek sanitarium; and photographs from the REO Motor Car Company. If you have questions about the tour, please contact the University Archives at archives@msu.edu or call 355-2330.